AMMONNEWS - His Royal Highness Crown Prince Al Hussein bin Abdullah II, on Thursday, visited the archaeological town of Al Sele’ in the southern governorate of Tafileh. His Royal Highness reviewed the Ministry of Tourism and Antiquities' plans to develop and promote the archaeological site, and services provided to visitors and tourists. During his meeting at the town's visitor center, Prince Al Hussein stressed the need to pay attention to all tourist and historical sites that Jordan has, each of which is qualified to be a tourist and economic success story. The prince was briefed on the progress of the Ministry's plan to develop the site and make it attractive to tourists, and pointed out that visiting the Al Sele’ town and its citadel should be considerable compared to their archaeological and historical value. The Crown Prince was also briefed by Minister of Tourism and Antiquities, Lina Annab, on the ministry's procedures in terms of restoring many of the archeological sites in the town of Al Sele’, and plans to develop the town's hostel, attract investments to operate the site and improve public services. Annab said the Crown Prince's visit to the town will have a significant impact in introducing this archaeological site to the world. 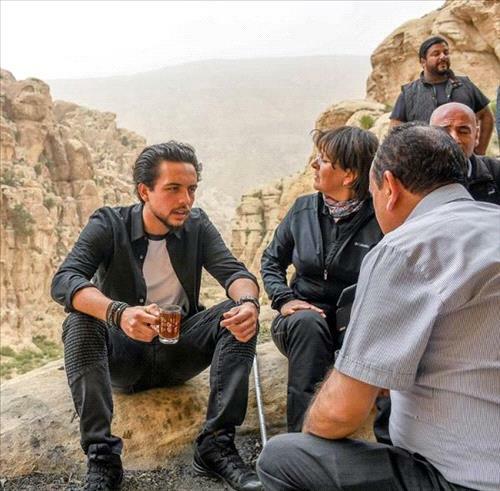 Prince Al Hussein toured the town of Al Sele’, walked through the Al Siq that leads to it and checked on the archaeological site, which is surrounded by unique geographical diversity between mountains and valleys. The town of Al Sele’ is located south of the town of Tafila, 16 kilometers away. It contains palaces, caves, models of art, sculpture, architecture, irrigation systems and archaeological watchtowers.